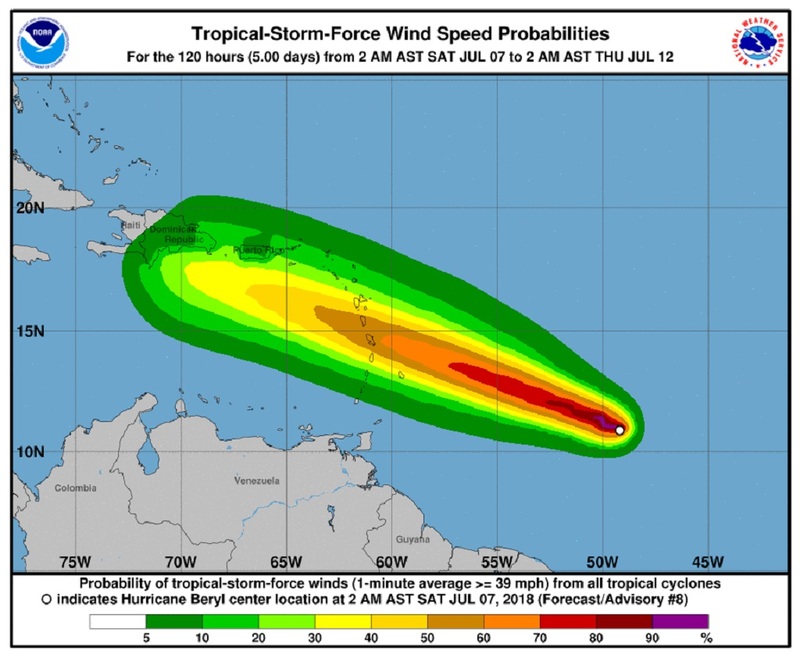 A Hurricane Watch has been issued for Dominica as the island, still recovering from Hurricane Maria, prepares for the passage of Hurricane Beryl as it approaches the Lesser Antilles. Barbados and St Lucia are also under Tropical Storm watch. 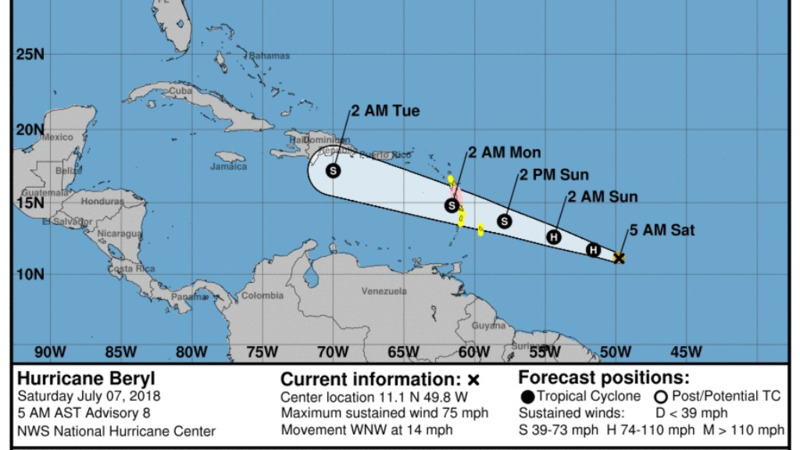 According to an update from the US National Hurricane Center (NHC) on Saturday morning at 5:00 am, the storm is due to pass over or near the islands by late Sunday or early Monday. 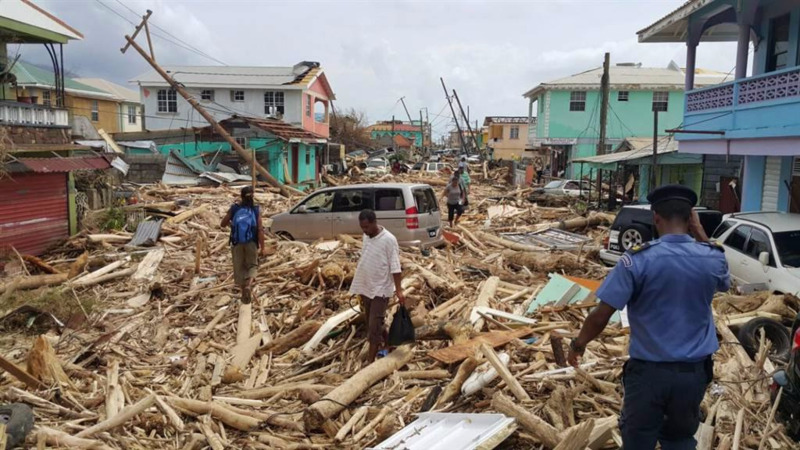 The storm is travelling west north-westward over the tropical Atlantic and carries maximum sustained winds of 75 miles per hour (120 kilometres per hour). 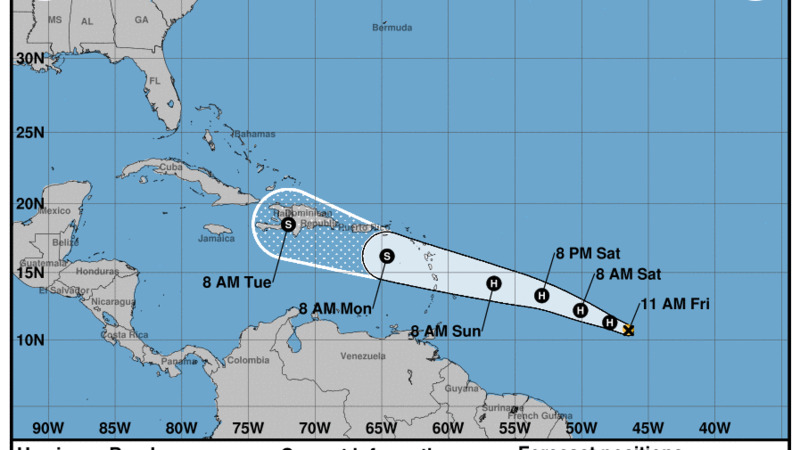 The Government of St. Lucia has issued a Tropical Storm Watch for St. Lucia. The Government of Barbados has issued a Tropical Storm Watch for Barbados. At 500 AM AST (0900 UTC), the center of Hurricane Beryl was located near latitude 11.1 North, longitude 49.8 West. Beryl is moving toward the west-northwest near 14 mph (22 km/h). A west-northwestward motion with some increase in forward speed is expected during the next few days. Maximum sustained winds are near 75 mph (120 km/h) with higher gusts. Due to the small size of the hurricane, short-term changes in intensity, up or down, could occur over the next day or two, but Beryl is forecast to be near hurricane strength as it nears the Lesser Antilles. Weakening is expected once Beryl reaches the eastern Caribbean Sea on Monday, but the system may not degenerate into an open trough until it reaches the vicinity of Hispaniola and the central Caribbean Sea on Tuesday or Wednesday.